THIS linguini with mushrooms and mascarpone is one of those recipes that is ridiculously simple but yields a result that is sophisticated enough for a dinner party yet cheap enough for a midweek evening meal. It oozes an almost beefy mushroom flavour (making it enjoyable for meat-eaters and vegetarians alike) that is beautifully offset by the parsley and the wine. Needless to say, you can use any pasta you like but fatter pasta such as linguini or tagliatelle go best with this sauce. This recipe serves four, so simply halve the measurements if you’re serving two or add 50 per cent if serving six. Tips: don’t stint on the parsley, make sure your serving bowls are warm and serve with crusty bread. Put the dried porcini in a small saucepan, pour in the wine and water and bring to the boil. As soon as the mixture starts to bubble, turn the heat off and allow to cool a bit (about 10 minutes). Put mascarpone into a bowl, top with black pepper and a grating of nutmeg. Then remove the mushrooms from the pan with a slotted spoon and place on a chopping board. Pour the remaining mushroom liquid into the mascarpone bowl and mix well. Place parsley on top of the mushrooms and chop both coarsely. Melt butter in a large, hot frying pan, peel then crush the garlic and add to the pan. Cook for about 60 seconds, then add the mushrooms and parsley. Cook for three minutes before adding the mascarpone mixture. Turn the heat down to the gentlest of simmers. Now cook the pasta according to its instructions. When ready, reserve a couple of tablespoons of the pasta water. 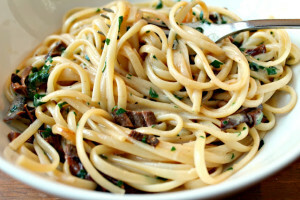 Drain the pasta and place it in the frying pan containing the mushroom and mascarpone mixture. Add the pasta water if the sauce is too thick. Finally, add the parmesan and mix through before serving in warmed bowls, adding extra parsley on top of each served portion. 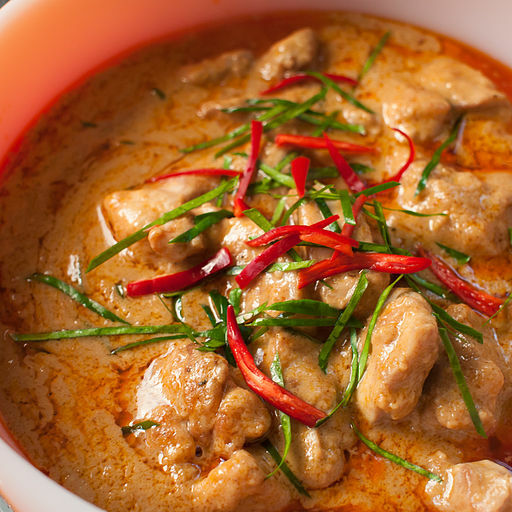 ONE of my favourite meals is a Thai curry – either red, green or yellow – and this recipe will give you results that will make you wonder why you every bought jars of paste with no taste from a supermarket. The result is a pungent, flavour-packed tastebud tingler that is spicy, sweet, sour and salty, all at the same time. The word “moreish” just doesn’t do it justice. Use chicken thighs, as they are better than breast meat in any curry, because they retain their firm consistency, don’t dry out the way breasts sometimes do and because they taste better. Furthermore, they are not expensive, so this feast from the east will not break the bank. Add king prawns at the end of the cooking period if you wish to give the Thai red curry a luxury touch (and to eke it out a bit further if your guests ask for second helpings, which they invariably will!). I have drawn the ingredients and method for this Thai red curry recipe from the memory of a trip to Thailand and from a number of respectable online sources and added my own stamp. I have used it on many occasions and swear by it. The amount set out here will give you a decent-sized jar of paste that will last refrigerated for days. Freeze it in ramekins, and it will keep for months. If you wish to make less, just halve the amounts. Blitz all of the above in a blender or processor until smooth and divide among portion-sized small containers –ramekins are ideal – for storage in the freezer or pour the mixture into a sealable jar for keeping in the fridge. Taste the curry at this point. If it’s too spicy, add more coconut milk. Allow to cool for about 20 mins.Reheat gently and serve with jasmine or basmati rice and naan breads, pittas or chapatis. DELEGATES from the Anne Penman Laser Therapy stable are today attending a social-media-for-business presentation and workshop, hosted by WordMediaCo director David Boyes. He will be explaining the main principles involved in the use of social media by corporate organisations and demonstrating some key techniques to help business managers capitalise on its enormous power. The fact is that social media is an immensely powerful way of communicating in an intimate way with your target audience. After today’s presentation at the Anne Penman offices in Glasgow, the delegates will have a clearer understanding of the principles of social media and how to use it regularly and effectively to locate and engage customers and potential customers, while building a credible online reputation. IT’S that time of year again – or, rather, that time of the year is coming back round fast. Yes, the festive period will be upon us soon, and that should concentrate the minds of those with an interest in apps. With Christmas exactly nine weeks away, businesses need to ensure their digital magazines, books and catalogues are ready for the biggest download day of the year. 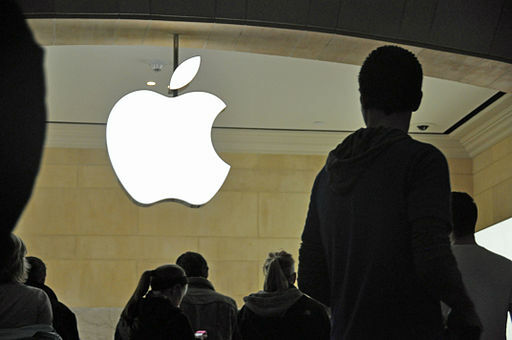 Apple will be closing their App Store to developers on or around December 21, 2013, which means that any new apps will have to be submitted to Apple by December 1, which is just six weeks away. Bearing in mind app developers will need a minimum of a couple of weeks to build any app (depending on its complexity and features, of course), then the time to act is fast approaching. So if your organisation is serious about selling its content in the optimum manner and to the maximum audience over the Christmas period, NOW is the time to get your thinking cap on. Android and iOS device activations reached an incredible 17.4 MILLION on Christmas Day LAST YEAR – an increase of 332 per cent on the rest of December. So guarantee yourself an Appy Christmas by making sure your content is there for everyone to download. HAVE you ever tried – and failed– to upload a PDF file to share on Facebook, either on your profile or business page? If, like me, you have , fear not. There is a solution. Or rather, there are a number of solutions. The reason PDFs cannot be posted to Facebook is because of their format (Portable Document Format), which is not supported by the social sharing site. Ordinarily, the document should uploaded to a different online location, such as a website, from where the link can be shared. But what if you don’t have a website? Well, if you have the right software, you can convert it to a JPEG or PNG – which are compatible with Facebook – and then share that with your friends or fans. But that can be fiddly and the results are sometimes less than professional in appearance. A quick search on the web will offer up numerous other alternative ways to overcome this this annoying little problem, but the simplest solution I have found is to sign up to Scribd. Scribd is a digital documents library that allows users to publish, discover and discuss original writings and documents in various languages. It’s easy to subscribe to Scribd and easy to share from from your account. Just copy the link from your document, paste it into your Facebook post (this will create a thumbnail too) and share. Easy! The video below will show you how to post a PDF document to your Facebook page/wall so you can share it with your friends, even if you do not have a website. Read the WordMediaCo blog for other social media tips and tricks. IN this social media-crazy world, it may seem ridiculous to consider the possibility of a human right “to be forgotten”. Yet this is exactly what is happening at the heart of Europe’s legal system – and the ramifications for Facebook, Google+, Twitter et al could be enormous. In an era of ever-expanding communication and an implicit acceptance of the concept of the “well-documented digital life”, the European Commission has probably set its continent on collision course with other parts of the world – not least the United States, which is the spiritual and corporate home of social media. The principle of the right to be forgotten – or, put another way, the right to be left alone – will go to the heart of the legal bedrock of Europe and the US. The roots of this entitlement exist in Europe and can be found in French law, which recognises “le droit à l’oubli” – a right that allows convicted criminals who have been punished (for certain crimes) to object to the publication of details of their criminal past. In the United Kingdom, the Rehabilitation of Offenders Act 1974 is an example of the acceptance of this principle of the human right to be forgotten. In America, by contrast, publication of someone’s historic criminal activity is protected by the First Amendment. If, as seems likely, the human right to be forgotten becomes enshrined in law in Europe, social media companies could be held legally liable if they fail to remove photos or information that people post about themselves and later regret, even if the material has been widely distributed already. This will apply to all European Union citizens, not just those who have been involved in criminal activity, and will form part of a greater civil data protection umbrella. “The best steps toward privacy and the right to be forgotten may be just to avoid the necessity in the first place,” argues academic and social media influencer John Nosta in a blog post here. It is my view that the solution may, unfortunately, turn out to be a little more complex. This, to me, is just one of many examples of the tussle that is playing out between, in the blue corner, the law, society and sovereignty and, in the red corner, iconoclastic social media companies and a disruptive concept of totally open communication that is being driven forward on a daily basis by millions of people across the world. THE business case for social media is now being laid out cogently and regularly by large organisations across the world, particularly in the United States. However, there is a perception that large organisations are the ones that stand to gain the most from the fastest-adopted medium in human history. This is not true, as a study proves. The key lessons being learned about social interaction are as relevant to large companies as they are to smaller ones. Whether an organisations is a multi-national, multi-strand business with tens of thousands of employees or an SME, the take-home messages are identical, as are the methods of application. One of the biggest changes that social media has introduced for corporate entities is the principle of interaction not just on a B2B or B2C basis but on a P2P principle. This ability to interact with a wider audience of people in a more intimate and meaningful way as they go about their daily lives is a hugely powerful and useful tool that has not been available to any business of any size up to now. Social media is now knitted into the corporate fabric of trail-blazing companies such as Pepsi, Virgin and American Express, who are developing the methods and principles of interactive best practice that will be followed in future by millions of firms the world over. Whether that’s talking to customers in inspiring ways, engaging with potential new clients, exploring radical new applications for social media or breaking down barriers within internal communications frameworks, these firms are all firmly committed to the cause. The question for SMEs now is: are you ready to lead your company and its employees into a new world of social connectedness or are you just going to sit back and wait until the time is “right” to follow? SOCIAL media is now a key way for investors to keep track of developments in the corporate world, thanks to a ruling in the United States. It is yet another indication that social sharing is becoming, almost by the day, more mainstream and that it has formed an essential component of modern communications. The ruling was prompted after movie-sharing company Netflix used Facebook to share information which boasted that their customer base had grown to a million subscribers, leading to an increase in share values. An explanation from the Wall Street Journal shows how social media’s stock is rising and how the Securities and Exchange Commission reached its landmark decision. FACEBOOK business pages can be a useful tool to aid corporate profile-building but many organisations remain confused about how to create a Business Page and why. Many companies are making the mistake of promoting themselves through Facebook profiles (personal accounts), either deliberately or by mistake. In the former case, they are aware of Business Pages but have opted not to establish one for any number of reasons. In the latter case, they just don’t know Business Pages exist and that they are fundamentally different from personal profiles. Whatever the reason, there is a danger that a company’s Facebook activity could come to an abrupt halt if they fail to follow the rules of this particular social media game. It has been widely reported that Facebook have started scrutinising accounts and are deactivating businesses that are not adhering to protocol. In this blog post, we will look at the principles of Facebook Business, or Fan, Pages and how they can be used to best effect.